As the Cristiano Ronaldo to Juventus transfer speculation hots up, here’s a look at five big names who could be ideal to replace him at Real Madrid. Now, it is of course quite likely that Los Blancos will never *truly* replace a player who looks set to leave the club having scored more goals than he’s played games for them in nine years on their books. Quite simply, the Portugal international is guaranteed to go down as one of the greatest players of all time, having smashed record after record since he moved to the Bernabeu from Manchester United. 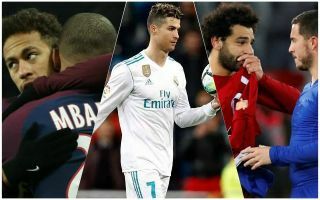 Still, there are world class attacking players out there who could go some way to repairing the damage left by Ronaldo’s potential departure, as is being reported by Sport and numerous others. Perhaps the player looking most likely to come anywhere close to doing what Ronaldo has done in the last decade, Mohamed Salah seems absolutely ideal for Real Madrid. However, with the Liverpool forward recently signing a new long-term contract, this is probably unlikely. Then again, this is Real Madrid we’re talking about, and a Real Madrid even more desperate than usual. With Salah scoring 44 goals in all competitions last season from out wide, the Egypt international could now be a serious contender for the Ballon d’Or and become the next great goal-scoring winger in the game.